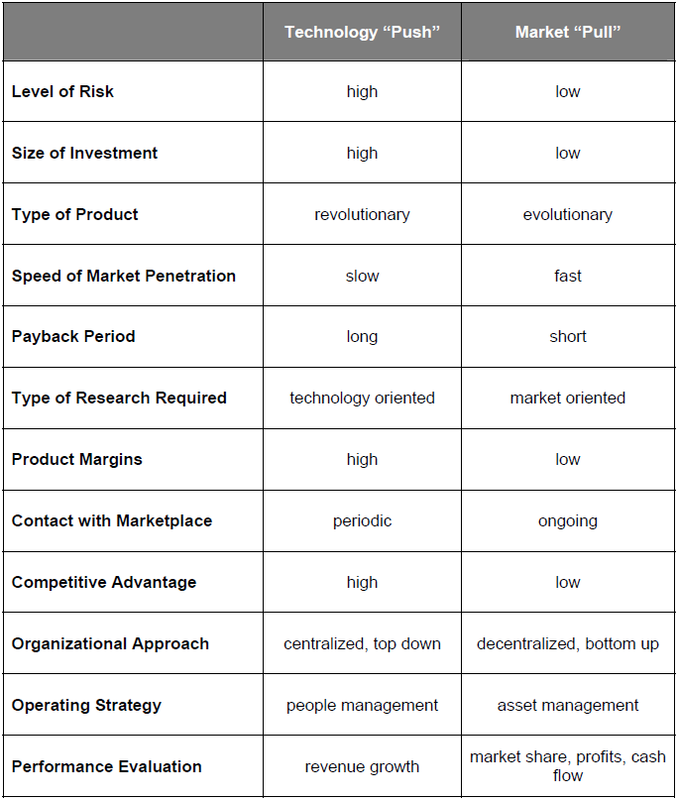 This tool provides a valuable checklist of specific ideas to make sure your company is organized for innovation. It lists specific strategies for creating an environment in which innovation flourishes. Among other things, it details the pros and cons of technological “push” versus market “pull.” It also describes the role of corporate headquarters in fostering innovation. There is a difference between “product” and “process” innovation. Successful innovation is most often based on market demand (the 7-10 rule): The “7-10 rule” states that historically seven out of ten successful innovations were driven by a recognizable customer need – rather than a new concept, technique or technology seeking a need. Delegate the vast majority of both product and process innovation to individual divisions and departments. – Types of projects: Customer databases, customer/supplier networks, new forms of distribution, etc. Types of projects: Faster cycle time, improved internal communications, development, etc. Monitor trade shows, journals, lectures, etc. Provide tools/techniques for “customer need” research, how to run focus groups, etc. Interested in saving this content? Download it here. LRI’s expert consultants can help you and your organization foster innovation. Please call us for a free consultation at 800-598-7662 or email your inquiry to info@leadingresources.com.